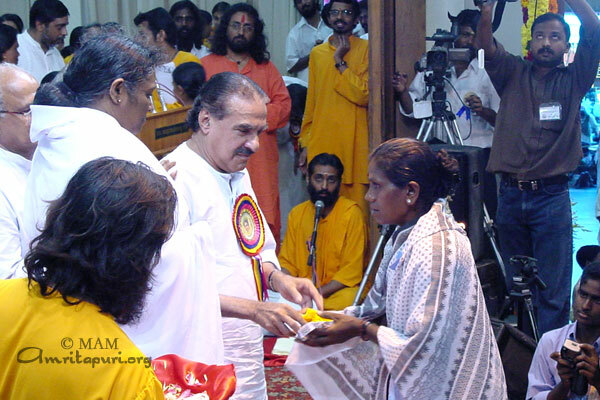 In September of 2001 Swami Purnamritananda Puri, one of Amma’s senior-most disciples, spent two weeks in Japan conducting programmes for Amma’s devotees throughout the country. He was accompanied by Br. Shantamrita Chaitanya, who served as translator and organiser of the tour. 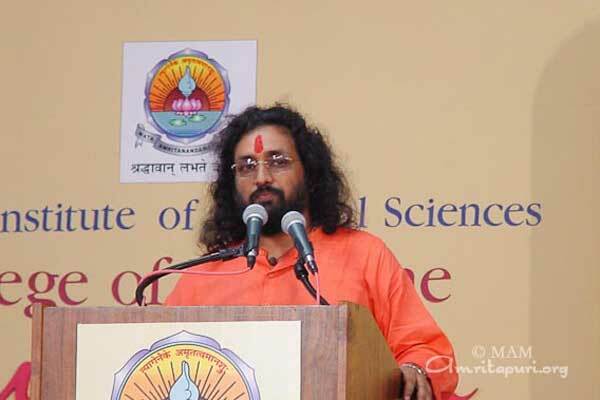 Swamiji’s programmes were well-attended even in mountain areas outside Tokyo. 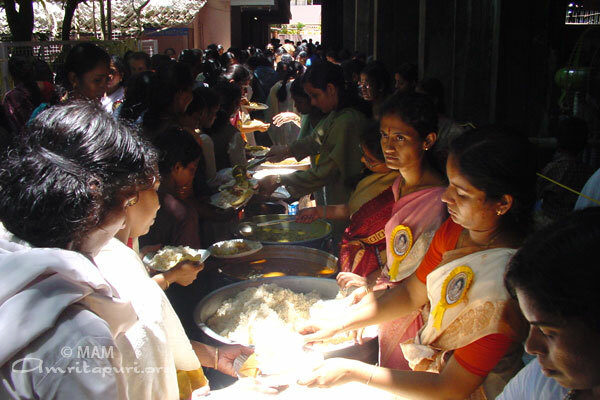 Amma’s many devotees throughout the country gave swamis a warm welcome wherever they went. 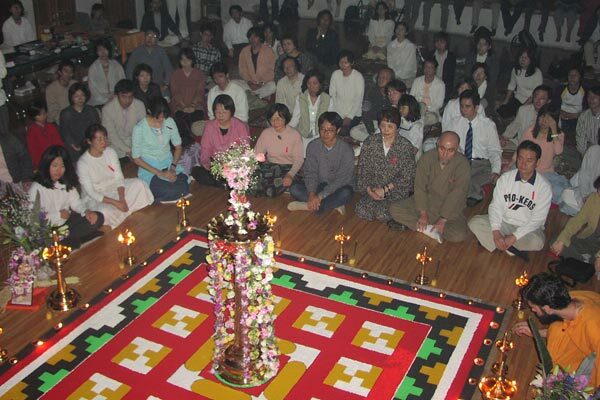 A special puja was held on 22 September during second retreat near Osaka, the second largest city in Japan, combining Lakshmi Puja, Durga Puja, and Bhagavati Seva. The location was an ancient Buddhist monastery called Koyasan, where Tantric Buddhism was first practiced in Japan 1300 years ago. Swamiji also met with Japanese Shugendo practitioners in Oita, including the head priest of the temple where programme was held performed the homa. 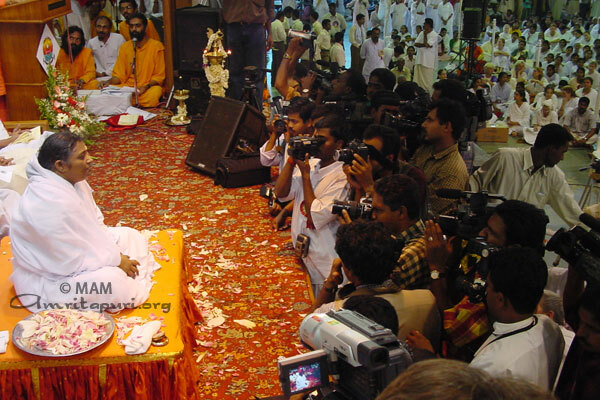 Swamiji’s flute playing was so popular that they asked him to play every single programme at the end of bhajans. He always made the last song a meditation, asking the devotees to focus on the sound of the flute. Many devotees said that it was very helpful and that in this way they experienced true meditation for the first time. Their minds merged in the flute’s peaceful sound vibrations. 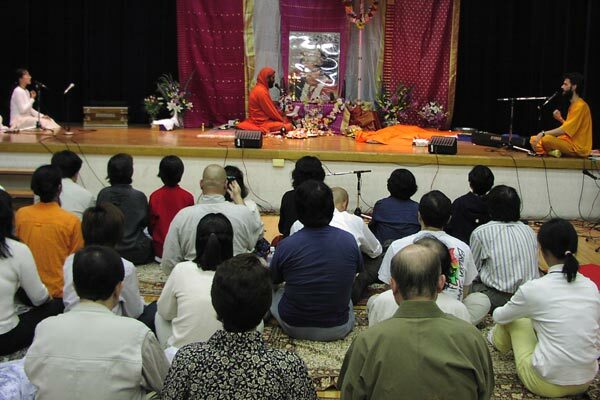 Swamis performed Bhagavati Seva during Amma’s birthday celebrations in Japan. The size of the padmam (sand painting) was nine feet by nine feet and took eight hours to make. The puja was preceded by a special birthday programme given by Swamiji, which included satsang, meditation, bhajans and prasad to all present. 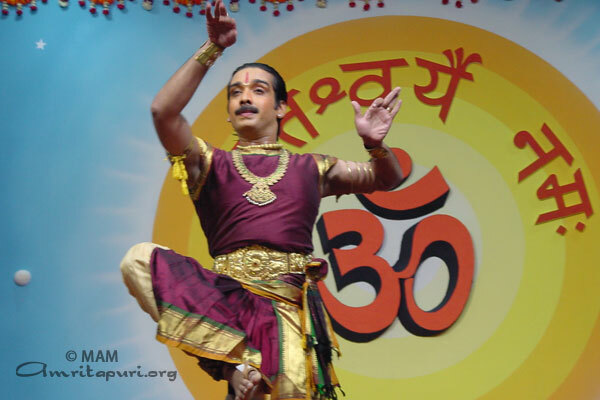 This year’s Amritakeerti Puraskar went to P. Parameswaran. Union Law Minister Jana Krishnamoorthy presented the award. 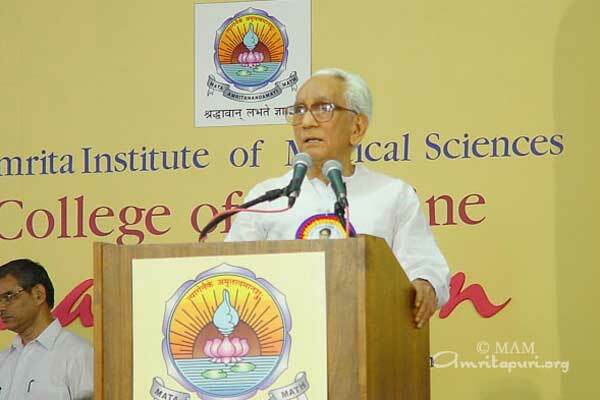 Sri Parameshwaran is an acclaimed and eminent scholar, thinker, and philosopher. He was born in Alapuzha, Kerala, in the year 1927. 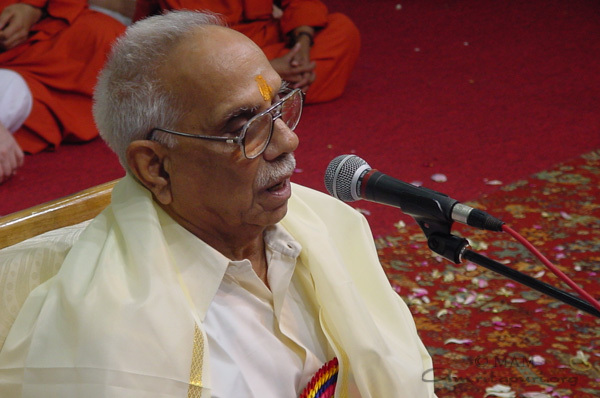 Shri Parameshwarji had his higher studies at University College, Trivandrum which he passed out with flying colours. Even as a student he displayed phenomenal oratorial and writing skills and delved deep into the studies of scriptures. The works of Shri Parameshwarji know no boundaries. All his works, including the treatise, “Marx and Vivekananda” have been acclaimed world over. The award carries an idol of Saraswati Devi, a cash prize of Rs. 1,25,453 and a citation. 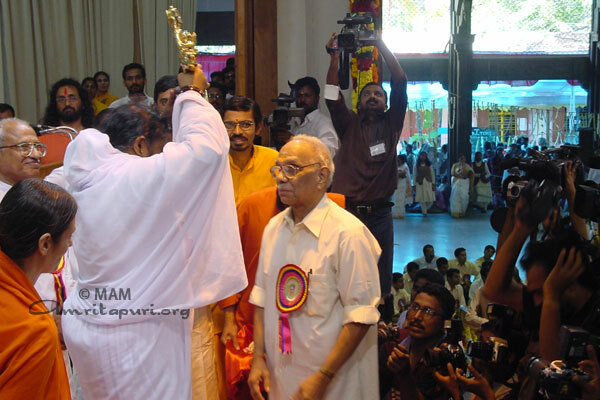 Accepting the award, Parameswaran said, “For me, this is not an award; it is prasad from Amma.” Parameswaran went on to say that in Amma he sees Janani (biological mother), Janmabhoomi (motherland) and Jaganmata (universal mother). As he presented the award, Krishnamoorthy said that spiritual personalities like Amma would lead society to the right path. India’s glorious ancient cultural civilization makes society vibrant and Amma can be described as an embodiment of that culture. On Amma’s birthday proper, Amma descended from Her room at 8:45 a.m., pausing for a moment to allow Her largest darling son, the elephant Ram, to place a garland around Her neck. 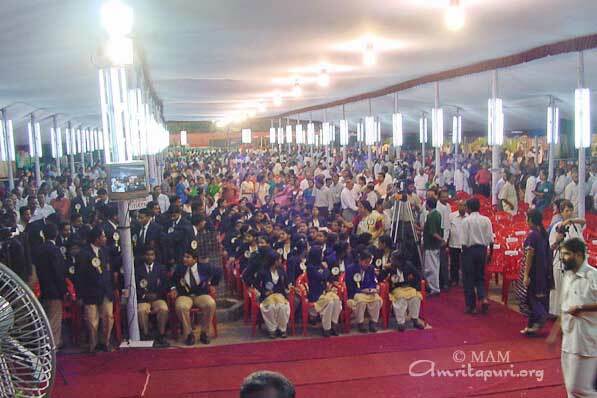 All those who had packed into the darshan hall rose to their feet to try and catch a glimpse of Amma as She made Her way up the centre of the hall to the stage. 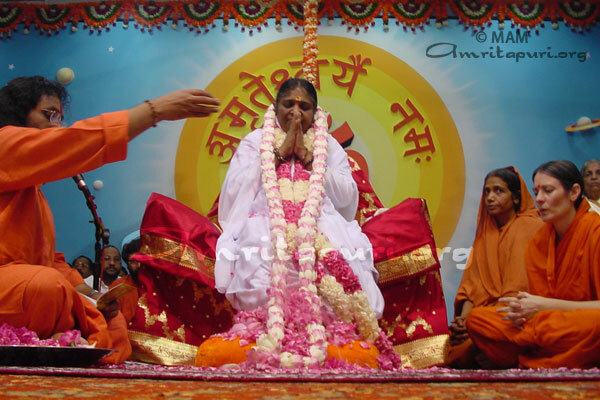 Upon reaching the stage, Swamiji performed the pada puja and placed a beautiful garland of pink and white lotus flowers around Amma’s neck. He then proceeded to cover Her feet with lotus petals while chanting Amma’s 108 names. 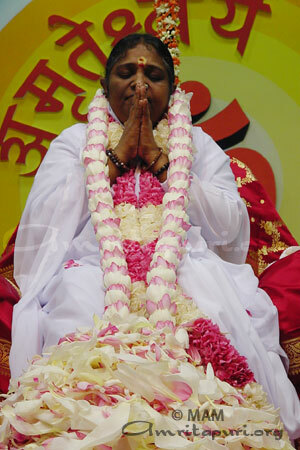 After blessing everyone with Her Satsang, Amma gave darshan until 5:30 p.m. When She returned a few hours later to begin the Devi Bhava darshan, Her way was lit with thousands of tiny oil lamps and a path of lotus petals was laid all the way from Her room to the stage. 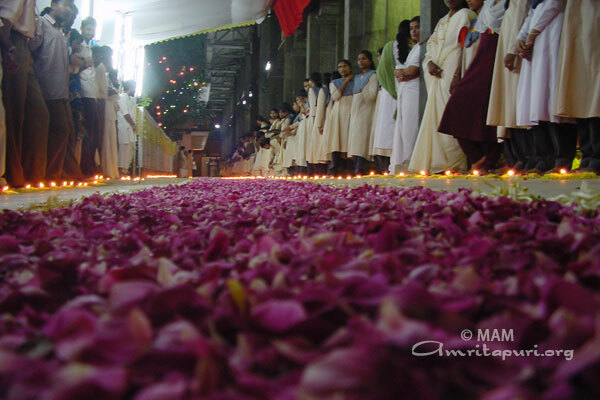 However, Amma walked to the right of the flowers – never stepping on a one. If only all the world could imbibe just an infinitesimal fraction of such humility. 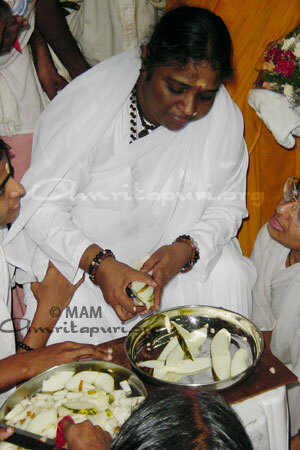 Amma’s Devi Bhava darshan lasted from 9:00 p.m. till 10:15 the next morning. As an expression of Her infinite compassion, Amma has been providing homes to the homeless and the destitute in Kerala since 1987. 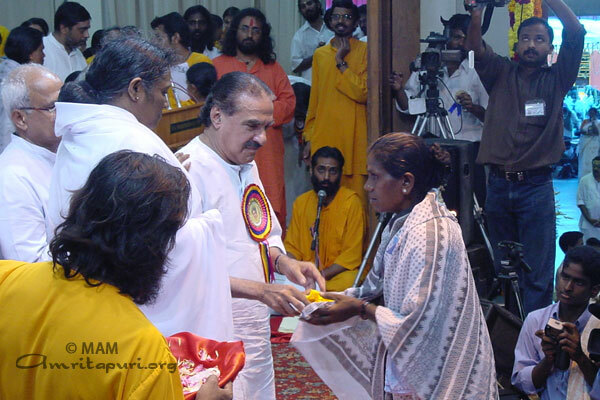 Moved by the plight of the homeless all over the country, Amma, later, launched the unique, and massive Amritakuteeram Project in 1996 for building 25000 houses for the homeless. Putting the project in place and identifying the beneficiaries, took almost 18 months. Hon’ble Prime Minister, Atal Behari Vajpayee, handed over the keys for the first 5000 houses in 1998. 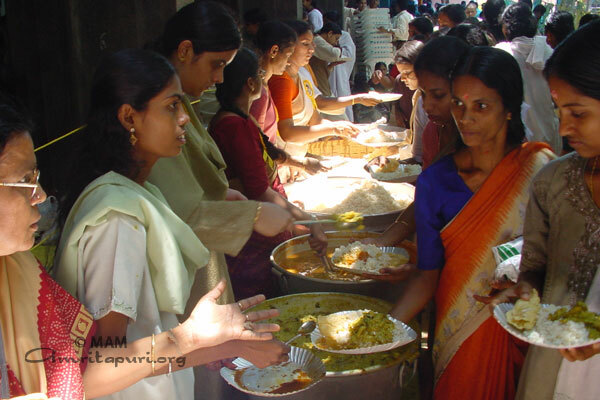 Since then, with Amma’s Grace, 25000 houses have been built all over India. This was possible only with the support of various State Governments, active and selfless participation of the disciples, devotees, students of Amrita Institutions, and well wishers. The contribution from the International community, particularly the students from Japan has been significant. 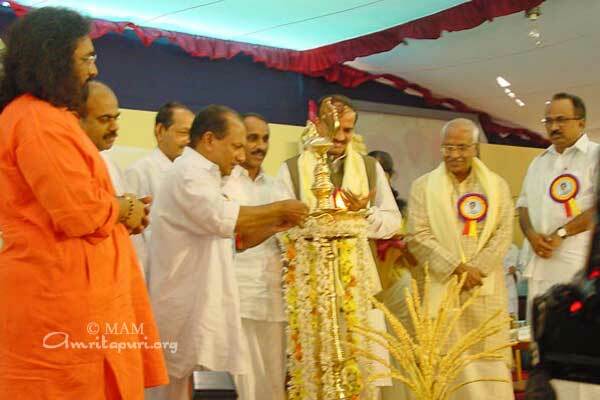 K M Mani, the Hon’ble Minister received the symbolic key of the Amritakuteeram Project from our beloved Amma. With Revenue Minister K.M. Mani handing over the keys to 5,000 free homes, the M.A. Math met its goal of providing 25,000 homes to the poor through its Amritakuteeram free-housing scheme. Amma then immediately announced the Math’s plans to expand the project. Its new goal is to build and distribute keys to 100,000 homes within the next 10 years. 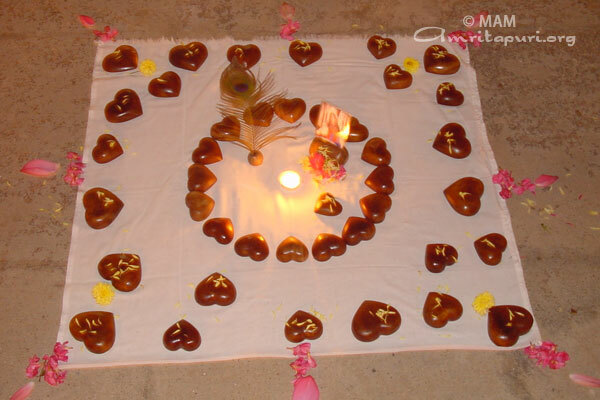 “Utsavam (festivity) is the state in which the mind overflows with Divine Love, when the Love that is within us finds expression in external activities. My children should pray for the peace and welfare of one and all, rather than indulging in outward exhibition. Mutual love is practically the only remaining treasure that we now possess. “Shraddha (awareness, alertness, carefulness — in thoughts and deeds; plus an awareness of the goal) in each word we utter, in our thoughts and in our actions is spirituality. If we continuously maintain this awareness within ourselves, we will be able to gain peace and happiness in our lives. If we don’t do what is called for at the required time, then all our actions will go to waste. 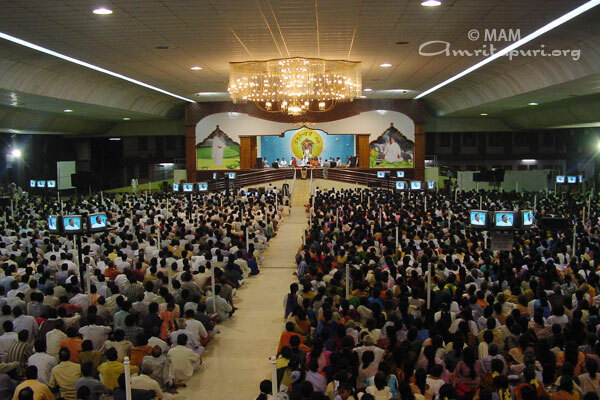 The day before Amma’s 49th birthday celebrations began, Amma talked some with the ashramites. With all the birthday excitement in the air, it seemed She wanted to remind all assembled that, in truth, we were never born, nor will we ever die. 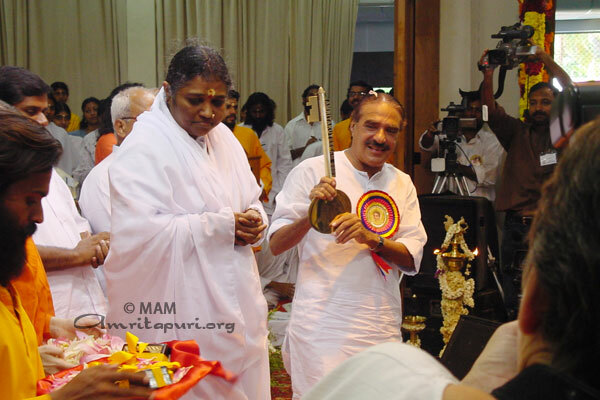 “The day that the thought that you were born dies is the real birthday,” said Amma. The day the Karthika Star rose in the Malayalam month of Kanni, was just the day Amma chose to incarnate on this planet, not Her birthday. 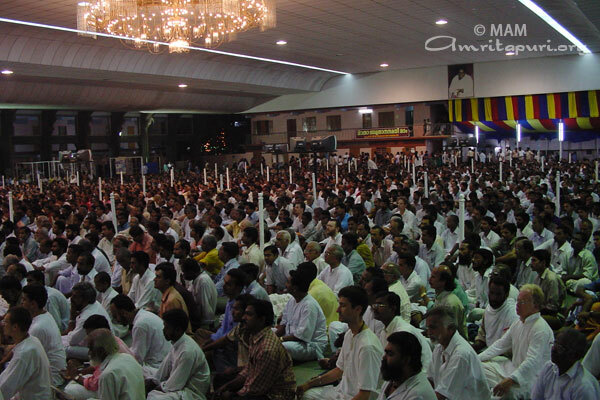 That said, more than 30,000 devotees came to Amritapuri to celebrate the anniversary of Amma’s incarnation on earth. Surely, this figure would have been higher had their not been an all-India strike on September 26th in response to the terrorist attack on a Swami Narayan temple in Gujarat. Rightly so, the atrocity, which left more than 25 Hindus dead, dampened the celebrations in Amritapuri, and Amma cancelled all but one of the scheduled cultural programmes. 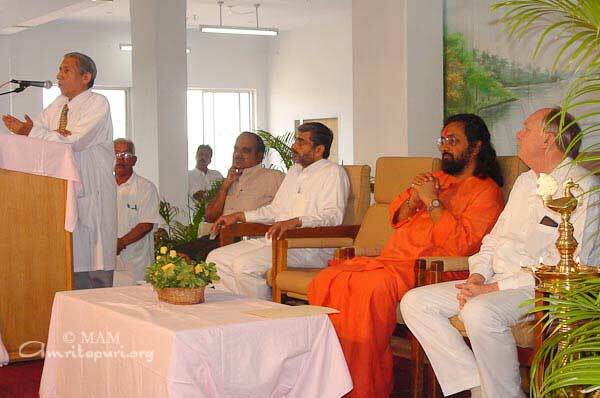 That night, Swamiji conveyed Amma’s feelings about the tragedy in Gujarat. 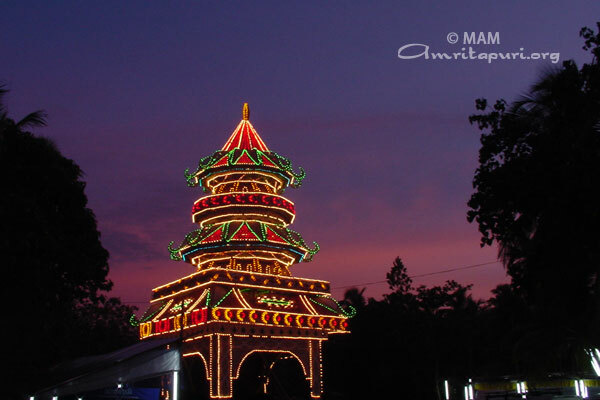 “Amma feels that sorrow, pain and fear are pervading the atmosphere. Now, not celebrations but action with awareness is what is needed. In the name of celebrations, japa, meditation, singing the glory of the Lord, prayer and selfless service is what is happening in the ashram. The evening’s one cultural programme was a dance by film star Vineet. Amma came to the stage to watch his performance. Before She returned to the room, Amma also paid a visit to the kitchen where She helped cutting a few vegetables. 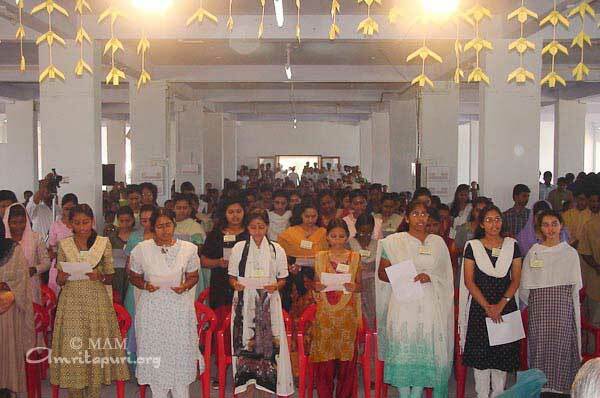 Inspired by Amma’s message of service and sacrifice, 75 students of Amrita Institute of Computer Technology, Cochin, have come forward with the Netra Daan Pledge, vowing to donate their eyes, upon their death, to the visually challenged. There are millions of visually challenged persons around. Fortunately, many of them can receive the gift of sight through small procedures. Some desperately need eye or cornea transplants. These AICT students have immortalised themselves — even after they leave their physical bodies, their eyes will continue to live, giving the gift of sight to visually challenged people and opening up worlds of previously unknown joy. 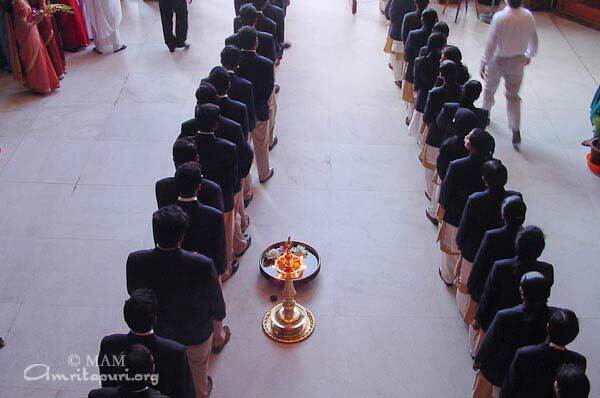 Offering this pledge before Amma, they have set a glowing example of selflessness to the world. 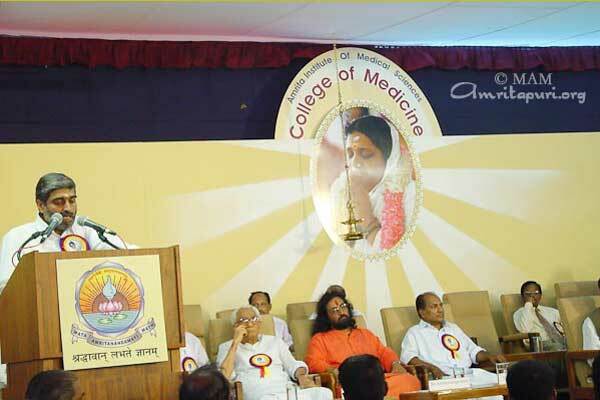 One more contribution to society from our most Beloved Amma – the College of Medicine at AIMS, Kochi – a majestic institution offering high quality education in the field of modern medicine. 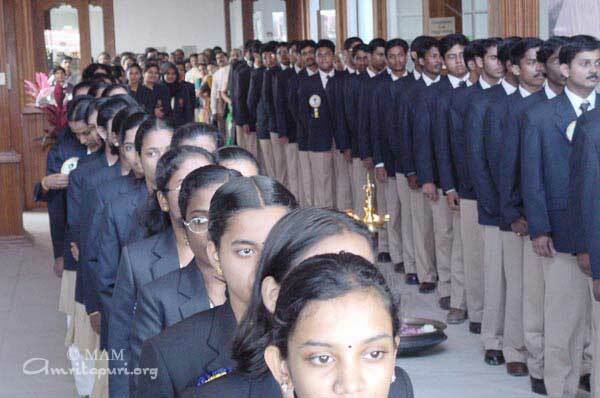 The college’s curriculum has been designed to provide value-based education and mould the character of the younger generation through a synthesis of science and spirituality so that their earnest endeavours to achieve progress and prosperity in life is matched by an ardent desire to extend selfless service to the society, one complementing the other. The college is moulded on a Gurukulam model, for every group of students there is a professor who looks after not only their academic needs but also helps them develop a well-rounded personality. The 12-storey, 1,20,000 sq.ft. 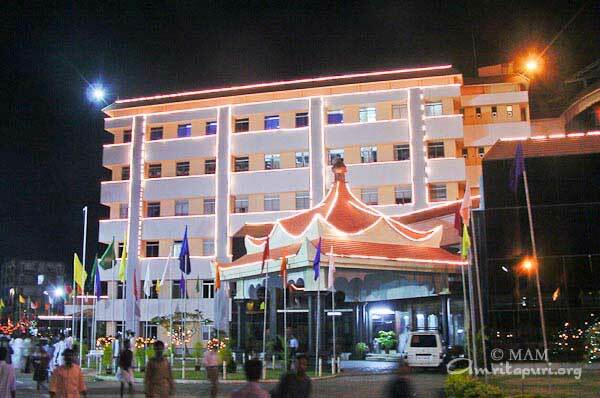 building in the AIMS campus built at a cost of Rs.50 crore, is fully equipped with the departments of anatomy, biochemistry, physiology, community medicine, forensic medicine, pharmacology and an anatomy laboratory. The Chief Minister of Kerala Shri. A.K. 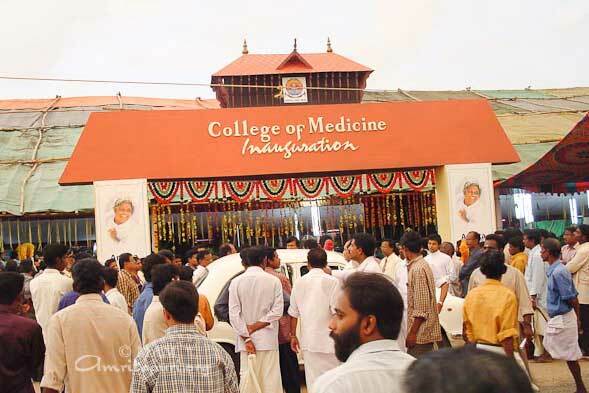 Antony inaugurated the college of medicine which is the first-ever to come up in the private sector in Kerala. 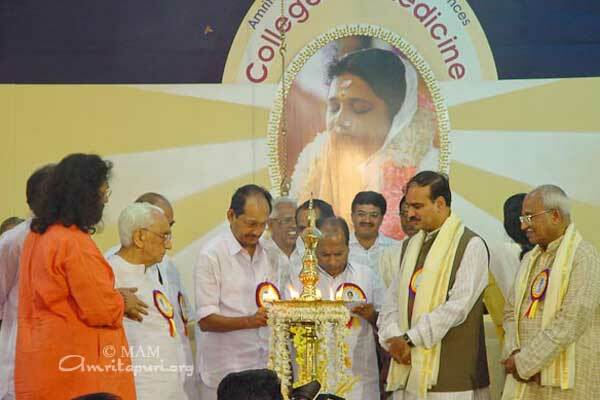 In his inaugural address, the Chief Minister described the opening of the first private medical college in the State as a historic event and said that his government would render all possible support to Amma’s service activities. The school’s opening was also marked by addresses delivered by Parliament member Shri K. Karunakaran, Swami Amritaswarupananda Puri and Honourable Minister of Health & Family Welfare of Kerala State Shri P. Sankaran. 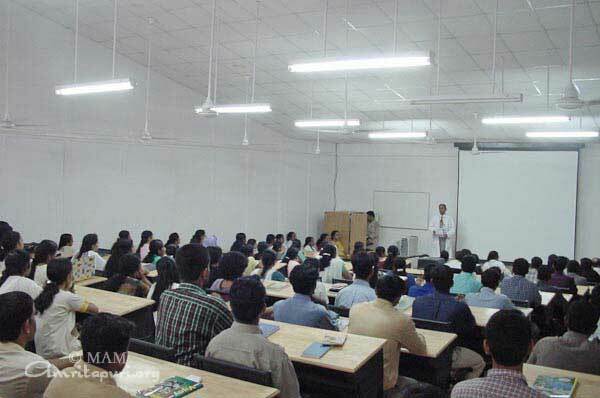 The college, which offers a five-year MBBS degree, has a first class of more than 100 students. The students’ first-year syllabus includes courses in General Medicine, Anatomy and Urban Health Care and Pharmacology. But while the students will be learning the ABC’s of general medicine, they will also be learning more than diagnosis and treatment. Classes have already commenced for the first batch of one hundred students. Ganeshotsav was celebrated in Amritapuri with great enthusiasm and devotion. 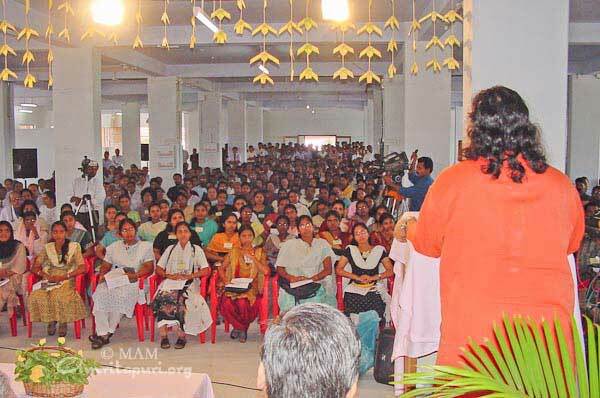 The celebrations commenced on the morning of September 10, 2002 with Gaja Puja (worship of the elephant) in the new prayer hall. The ashram elephant Ram – adorned with sandle paste and the traditional golden head ornamentation – was worshipped as the form of Lord Ganesh. During the singing of the Ganesh Arati, Ram rhythmically swung his trunk and ears, enthralling everyone in attendance. He was later fed with a plateful of modaka (a sweet of which Lord Ganesha is said to be fond) and payasam (sweet pudding). An idol of Lord Ganesh also was installed for worship near the ashram’s old temple shrine. Pujas were held there for five days, with the traditional arati, “Om Jai Gananatha Hare,” in the evening. On the fifth day, a grand procession brought the idol to the beach on a decorated cart, where it was immersed in the ocean (Ganapati Visarjan). In the Hindu tradition, Lord Ganesh holds a very important place. 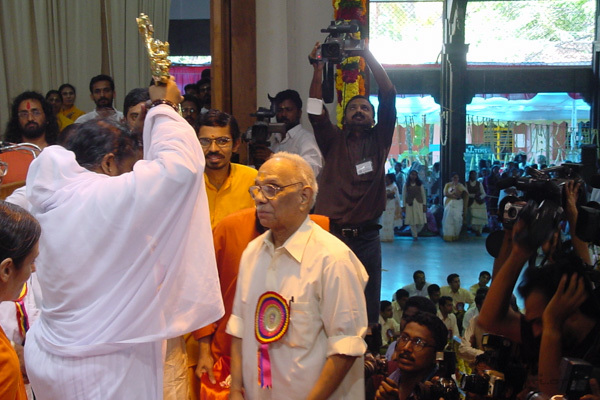 He is first worshipped before the start of any activity. He is extolled as the ‘Remover of All Obstacles’ and as the ‘Bestower of Auspiciousness.’ Immersing the idol signifies the importance of going beyond the realm of name and form, and merging with the Supreme Consciousness.